Did Christ intentionally eat with the worst of the worst to upset the Pharisees? Was Jesus a good dinner guest? What is a Greek symposium and does their presence in the gospel narratives discredit their historical reliability? These are not the typical asked questions by laymen. Instead they are the technical questions asked by students of biblical theology. Craig Blomberg in Contagious Holiness works through the Scriptures in an effort to clarify and quantify the table ministry of Jesus Christ in the New Testament. Blomberg’s tone is concise but dry. The usage of technical quotes and language is high. There are many technical footnotes that will detour casual readers. As part of the New Studies in Biblical Theology (NSBT) this is to be expected. The results though do have practical application to the church and its future with table evangelism. In chapter two, Bloomberg demonstrates that Old Testament meal narratives encourage eating with friends but avoiding enemies. The table becomes the fence of friendship and acceptance. Similarly in chapter three, Bloomberg shows that extra biblical sources including those in the intertestamental period reinforce and exaggerate this ‘eat with friends but avoid enemies’ paradigm. The concept of impurity being shared at the dinner table is introduced. It is here that the washing rituals that lie at the foreground of the New Testament begins to be seen. In the New Testament, Jesus Christ clearly and decisively breaks this mold. Throughout the Gospels, Jesus flips the role of the table and holiness/impurity on its head. Instead of meals being a way of defining the righteous in the world, Christ presents a wide open table and makes purity contagious. When Christ eats with sinners He is not worried with sinners rubbing off on Him. His mission is to have His holiness fall onto others. This upset the Pharisees with whom Christ ate. Christ did not exclude the self-righteous. Yet, Blomberg shows through repeated encounters that Christ’s interaction during these dinners barely qualifies as polite guest behavior. Similarly, contra the thesis E.P. Sanders, Jesus is not presented as one who eats without presenting the kingdom of God along with repentance. Just as Jesus was provocative with the self-righteous Pharisees, His parables and teachings would have encouraged repentance and life changes. 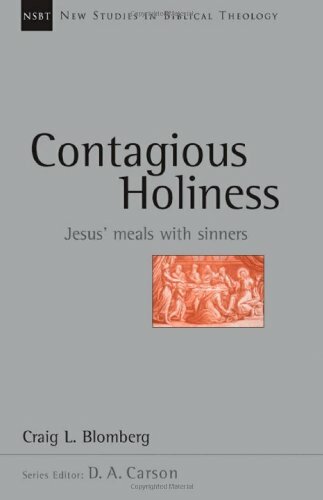 In conclusion, Blomberg’s Contagious Holiness is the technical background that many pastors and elders need to encourage their local churches to food-oriented ministries. However, Blomberg is technical and dry in a way that will turn off many laymen readers.